Where are you staying on your next trip to Helen, Georgia? Northern Georgia is one of the most beautiful places to go camping with your your family or friends. Sleeping on the ground or in a cramped recreational vehicle isn't for everyone, though. That's why so many people make the decision to stay in a cabin when they visit the Helen area. But not all cabins are created equally. Why settle for the bare minimum when you can live in the lap of luxury on your getaway? 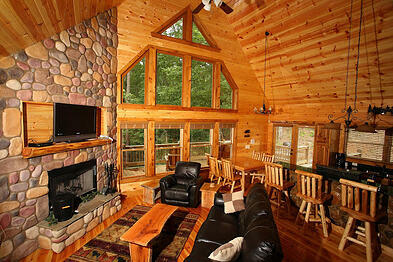 Luxury cabin rentals are growing in popularity. These spacious and amenity-rich vacation homes can make the difference between a trip that is mediocre, and one that is totally magical. You can rest assured that the normal problems and complications associated with vacations won't happen in your rental. Here's a look at 6 frustrating things that won't happen in a luxury cabin. When many people think of a cabin rental, they imagine a dilapidated old shack that doesn't have electricity or running water - not too appealing. You may be surprised to learn, then, that luxury cabin rentals are equipped with all of the creature comforts that you need to relax and unwind. Your cabin will feature electricity, climate control functions, and hot, running water so that you don't have to feel like you have been transported back to the stone ages on your trip. No one likes feeling like they are living on top of their family and friends when they are vacationing. Unfortunately, this seems to happen more often than we would like. Staying in a small hotel room or a cramped, old cabin forces you to get a little closer to others than you are typically comfortable with. That's why so many people prefer to stay in a luxury cabin rental. Here, you will be able to spread out and offer everyone their own bed, and even their own bedroom for even more privacy. Multiple bathrooms will allow Mom to enjoy a long soak in the Jacuzzi bath while everyone else is still able to get their showering and morning routines taken care of. With all of that extra space, you'll put an end to the bickering and really enjoy your time spent together. These days, most of us prefer to stay connected and up-to-date on what is going on in the world. Although you want to get away from the stresses of every day life, there are still times when, even on vacation, you need to keep tabs on how things are going back at the office, or to check up on your relatives or friends. Being without an Internet connection, then, is not ideal. Luxury cabin rentals can offer vacationers access to high speed or wireless Internet access so that they can upload their getaway photos to social media, stay current on the news, and send an e-mail to their co-workers whenever necessary. With so many cabins having been featured in horror movies, it's not surprising that some folks are a bit wary of staying in a cabin rental. But luxury cabins are not the creepy old shacks that you see on film. There are no vacation rentals built on ancient burial grounds or things that go bump in the night. For your peace of mind and comfort, you can even choose to stay in a cabin that is located in a gated community where you will be safe and protected throughout the duration of your stay. Cabin fever is absolutely unheard of when you stay in a luxury cabin rental. No matter what the weather is like, there's always something to do inside of and around your vacation home. Imagine watching the sunrise from your cabin's front porch while watching a peaceful stream or waterfall. 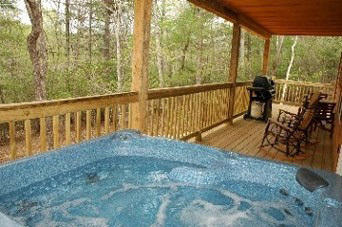 Begin your day with a hike in the woods surrounding the rental before enjoying a long soak in your own private hot tub. Have fun with your family as your play in your game room, watch a movie, or trade stories around your fire pit. There's something for everyone. The best part about staying in a luxury cabin? It is extremely affordable. In addition to being reasonably priced, you'll never be charged extra for fabulous amenities, and you can even save money on meal costs by cooking up dinner at the cabin. There's no reason for you to deal with headaches and hassles on your vacation. When you book a stay in a luxury cabin rental, you can avoid problems and enjoy your entire trip. Are you ready to pamper yourself on your next Helen, Georgia getaway?